The last month I have not written much here on the blog. However the inactivity does not mirror what I have been up to. I spent a lot of time lately, screening for stock picking ideas, reading, listening to inspiring podcast and most of all thinking and contemplating. My screening which will be covered in a separate post has made me realize that I need to significantly improve the way I look for new potential investments. The power of screening increases significantly when you have the luxury (like I do) of looking for stocks all over the world in all market cap sizes. The reading I have done lately has in part been inspired by trying to understand more what metrics I’m looking for in companies that I want to invest in over the long term. Hopefully the steps which I’m about to take over the coming months will be crucial to take my portfolio and investment process to the next level. Slowly but surely the aim is to move towards a more structured and professional investment approach. My thinking and contemplation has mainly been around two things: 1. What markets are up to currently, if and how I need to adjust my approach. 2. How my portfolio construction should be structured to maximize my changes of success. That’s what I thought I write about today. Let’s start with the current market environment. Anyone not living under a rock for the last six months has been flooded in the news about Trump, China and the Trade War. But return wise for most global stock portfolio this has so far had minor impact. US stock markets are at all time highs, Europe is doing pretty well (except Turkey). So far only one major stock market has really fallen significantly and that is China/Hong Kong. Although I made a point of reducing my exposure towards China already back in May 2017 (Rotate away from China). 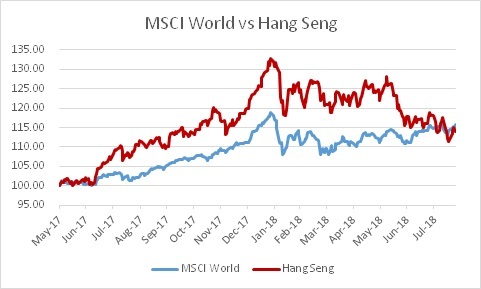 I still keep a large overweight compared to MSCI World in Chinese related stocks. Either that they are listed in Hong Kong, or that they actually are materially exposed to the Chinese economy. Below is the total return of both benchmarks since I made my post about rotating away from China. The trade war puts a stock picker in a bit of a conundrum. Most Macro events should be ignored by a stock picker, but the Trade War actually becomes a company specific event as well. In my view it can not and should not be ignored. The effects of the tariffs are so big that a producer in China could be totally out-competed by a producer in another country, as soon as the tariffs comes into place. One could say that the Trade War is bigger than just China and USA, that’s probably true and Trump might for example still have a beef with the Japanese car producers and the imbalances created there in trade. But for now I have just focused on US/China conflict and how that has affected my portfolio. I have not looked at the stock market in this light before, but I tend to group companies like this since the Trade War started. Especially for stocks listed in Hong Kong. Companies which mainly sell products and/or services to Chinese consumers. Here the main risks are more subtle, how will the Chinese economy fare if the Trade War intensifies? For the first time ever since I started visiting Mainland China, the people I talk to are afraid of the Trade War effects on the Chinese economy. I just have to point out how rare this is. I discussed everything from ghost cities, rampant borrowing, spiraling property market etc, nothing has really moved the belief among the Chinese I talked to, the only way was up. This is the first time I hear the Chinese people themselves admitting that this could end badly. One should not underestimate the effects such a psychological shift has on an economy which has been a one way street for so long. This makes me worried about my large China exposure. Companies producing products in China and mainly selling products to the USA/World, but products currently not on the list of tariff goods. Here the risk is more obvious and probably the area where one should be most careful. The stock market has probably not fully discounted that the companies products will fall under future tariffs. An excellent investment thesis could be destroyed by the stroke of a pen from Mr Trump. Companies producing products in China and mainly selling products to the USA/World, products already on the list of US tariff goods. These companies have probably already seen most of its initial stock price fall already. There might be opportunities here if the company somehow can navigate through this mess, perhaps relocating production or other measures. The rest – Companies with little or no direct exposure to the Trade War. Here we should more be looking at indirect effects. A lot of companies producing products in other countries are reliant on parts from China, which might be under new tariffs. This could quickly alter margins and shift advantages to producers in other countries which has non-Chinese suppliers of their parts. The problem here is it requires very very deep due diligence to understand these dynamics, if the management is not upfront about it. Dream International (although majority of production is now in Vietnam). I don’t hold any company with significant portion of their goods under current US/China tariffs. Since I have very few US based holdings I don’t see any major effects here for my portfolio. So the conclusion for my current portfolio is that I have to be mindful of the general economic strength of the Chinese consumer. If they stop spending, my portfolio would be hurt significantly with so much direct exposure to Chinese consumers. So should I reduce my exposure? If this really pulls down China into a recession and all the unraveling of leverage that would mean, then yes, I really should reduce my exposure. My this is threading dangerous grounds, because now we are not talking about company specific effects anymore, this is Macro. As we concluded many times before as a stock picker we should be wary to try to time too much macro. The truth is I haven’t really made up my mind yet. Let’s look at the other side of the coin too, opportunities. Such serious fall in one stock market also gives rise to opportunities. The same reasons why I had such an overweight towards China when I started the blog was partly due to the relatively low valuations compared to other markets. When the Hang Seng now is falling when other markets are rising, this puts me in a tough spot again. Hong Kong stocks looks cheap, but I already have a significant exposure, if I find something very interesting, do I dare to add more China exposure? I think my conclusion so far is, very selectively and with a larger margin of safety than before. I have one investment idea (again in a fairly illiquid company unfortunately), if it falls a bit further, it might enter the portfolio during the autumn. Please give your comments on what do you think of my portfolio taking larger tilts towards China in such sensitive times? I written quite a lot about the importance for me to find investments that I’m comfortable holding long term. I think this will always be main foundation of my portfolio, lower turnover and a long-term approach to investing. Although a few of my holdings to do not fully meet all my investment criteria (which I by the way will define more clearly later), in general I hold a portfolio now which I’m more comfortable with holding for the long term. I realized now, that reaching this is actually a very nice feeling in many ways. Mostly because I can relax more in terms of following up on my holdings. Instead spend that time on rather finding new good investments and taking my time to do so. Before there was always a stress to find something new to invest in, since many of my investments were short term and I knew I needed to replace them with new ideas rather quickly. This brings me to my next point. I actually miss not being able to invest in what I would call a swing trade. A large part of my investing “career” I dedicated to following the markets very closely. I’m a contrarian investor at heart and I almost love catching knives (until I cut myself badly on them and need to lick the wounds for a while). Many of my investments in the past were at infliction points in stocks and actually I think I’m rather good at it! So this focus on long-term has taken away some of my possibilities for short term swings when I see an opportunity. Supposedly I could just do these trades outside of the GSP portfolio, but that’s not really what this blog is about. This is my journey to become a better investor and if I think I’m good at something, it should be evaluated properly under the scrutiny of the blog. 80% Long Term Holding – My current portfolio of long term holdings, target holding period 5+ years, maximum 15 holdings, range of allocation allowed 65%-90%. 10% Opportunistic Holdings – Holding period maximum 2 years, maximum 2 holdings at any one time, range of allocation allowed 0%-20%. 10% Speculative Holdings – Holding period could be short or very long term. Minimum position size (at acquisition) 2%, Maximum position size (at acquisition) 3%, range of allocation allowed 0%-20%. 0% Cash – Maximum Cash position 15% – I reduce my max cash position from previously 25%. The idea of the speculative trades is to be able to sustain larger losses on several speculative positions, but hopefully that one or more will make up for it, by its high returns. The speculative positions could be everything from a micro cap with a potential success product, or even a larger company, where earnings are yet to be proven (think Biotech etc). More on this later. During the rest of the year I will restructure my portfolio and introduce especially new holdings in terms of the speculative positions. In due time I will evaluate the performance of the different “buckets”, but main focus will still be on total performance of the whole portfolio. All comments on my changes are appreciated, since I feel they are not 100% set in stone yet. Thank you for a well reasoned analysis. If we are trying to time the bond market and avoid that a negative year then we are speculators, not investors. Interesting shift! I think it’s smarter to capitalise on your strong points instead of focusing to much on your weak points. For your long term part I think the China trade war tensions are probably an opportunity. Investing in Chinese stocks has become more and more common these days, so valuations went up a lot. Of course China stocks are still undervalued in relation to their peers for obvious reasons( trust issues, government etc). I’d say the trade war is an opportunity because in the end I think that China and the US will come to some sort of agreement. It could also be good for China to get some structural reforms on the move. And of course structural reforms again could be a major tailwind for China stocks. So I think times like these are great opportunities for us to get a good price again on China stocks. I’m really interested to see opportunistic and speculative trades. If they pan out, would you consider holding them for longer ? Thanks Bart, yes of course I will try to hold them longterm, the idea will be that its speculative trades that most likely will take time to play out (with a lot of volatility along the way).